If you are no longer able to access your files, it might indicate that a ransomware program is up and running on your personal computer. One such program goes by the name of Hakunamatata Ransomware. It has been roaming the web lately; therefore, it is critical to be aware of its existence. In many cases, users infect their operating with this or any other devious program because they lack knowledge about virtual threats and the importance of virtual security. In this article, we provide information regarding malware distribution and present a few basic but extremely effective tips that will allow you to avoid any dangerous software. You will also find detailed information about Hakunamatata Ransomware and how it works along with a comprehensive removal guide crafted by our skilled malware researchers. Be sure to make use of these instructions and delete this malware if it is already active on your personal computer. Hakunamatata Ransomware is not that different in its functionality compared a lot of other ransomware programs that are active nowadays. Once it is launched on your operating system, it starts doing its dirty work without any delay. The encryption takes little time and is executed in complete silence. It is designed in such a manner so the average user would not realize that data on their PC is being permanently locked. By using a strong AES-256 and RSA-2048 ciphers to encrypt data malware developers eliminate any chances of manual decryption. During the investigation, our research team has discovered that this malware locks image and text files; while this will not compromise your operating system you could still permanently lose a substantial amount of valuable data. Each file encrypted is tagged with the .HakunaMata extension. Once the encryption is performed, you will notice an .html file on your desktop. 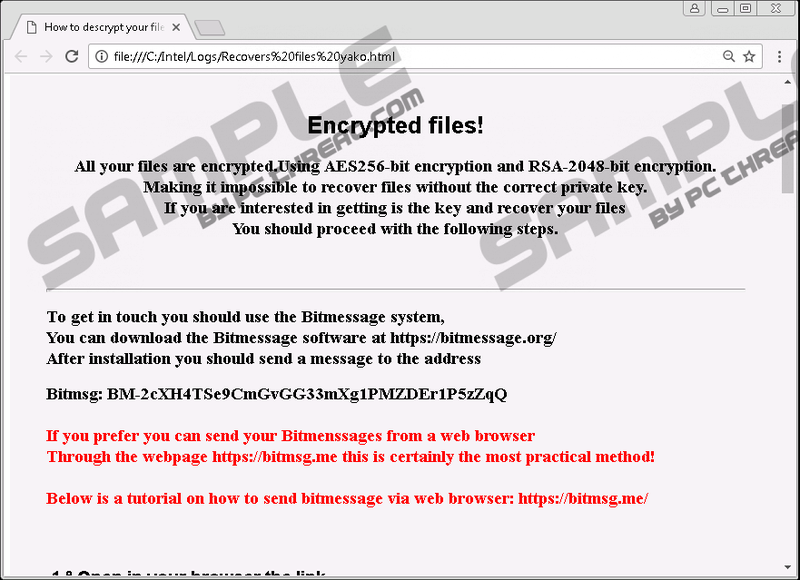 It is a ransom note that informs you about what has happened and that you need to get in touch with creators of this malware via Bitmessage system in order to regain access to your data. Such form of communication is worrying as it is completely private. Cyber criminals exploit this feature as it allows them to stay absolutely anonymous. We firmly advise you not to get in any contact with developers of this devious piece of software as they will likely try to lure money or your credit card data. Thus, you could lose much more than personal files. Do not hesitate and conduct a complete removal of Hakunamatata Ransomware at the very same time that it is found up and running on your personal computer. There are a number of ways that you could come across not only Hakunamatata Ransomware but other malware as well. One of the most prominent methods of distribution used to spread devious programs is via spam e-mail attachments. Avoid getting your PC infected in such a manner by simply refraining yourself from all e-mail attachments that come your way from unknown sources. Another popular way to spread dubious applications is through bundled installers. Such setup files usually host a number of suspicious and otherwise questionable programs and are up for download on unauthorized distribution websites. Thus, it is important to acquire all of your programs only from authentic developers' web pages as they do not tend to provide software bundles. Do not forget that nowadays in quite a few instances malware developers use manipulative advertising strategies to trick unsuspecting users into obtaining and installing their dubious products. Therefore, our research team encourages you to learn as much as you can about the program that you want to have before even acquiring it. Lastly and most importantly, your best bet to keep your operating system safe and secure at all times is by having a reliable antimalware tool active on your PC as it provides virtual security at all times. By taking these preventative steps, you will make your system virtually unbreakable. The removal instructions that we present below must be executed with care as a single mistake could result in an incomplete removal of Hakunamatata Ransomware. This is a situation you do not want to find yourself in as traces of this malware could prove to be enough for it to continue its harmful functionality. In other instances, leftovers might be used for a restoration procedure. Avoid finding yourself in such a situation by performing a full system scan with a professional malware detection and removal tool right after you have executed the manual removal. Locate a malicious .exe file then select and delete it. Remember that the name of this file is random. Quick & tested solution for Hakunamatata Ransomware removal.